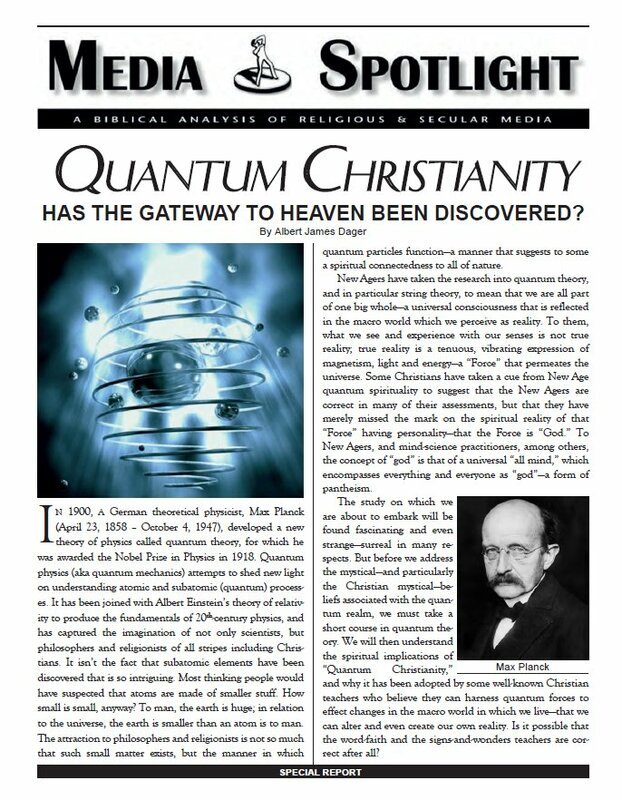 QUANTUM CHRISTIANITY HAS THE GATEWAY TO HEAVEN BEEN DISCOVERED? What are the spiritual implications of the relatively new scientific field of quantum physics? Is it possible, as some well-known, influential Christians say, that believers can harness quantum forces to effect changes in the macro world in which we livethat we can alter and even create our own reality? Do Christians possess the same power and authority of Jesus? This special report addresses those questions and more as it delves into the teachings of those who relate the quantum world to the spirit realmthose who believe that by accessing the quantum realm under the anointing of God, Christians can translate those phenomena into the macro world in which we live, and will one day be able to perform many signs and wonders, even bringing into the present, promises of God meant for the millennial Kingdom of God on earth. Scientists today are rethinking human nature, rejecting Gods Word and working to develop a new humanityone that does not die, but will live forever through the uploading of human consciousness into a virtual reality. Brain-computer interfaces are already a reality, and the goal of transhumanist research is to bring humanity into the state of godhood. Can such dreams become reality? Transhumanists project that their goals could be achieved within the next few decades. What was science fiction yesterday has become reality today. The last days anti-Christ might well employ transhumanist research to develop soulless entities that will do his bidding to enslave mankindan army of cyborgs envisioned in the darkest scenarios of science fiction. Is the Body of Christ ready for such a scenario? 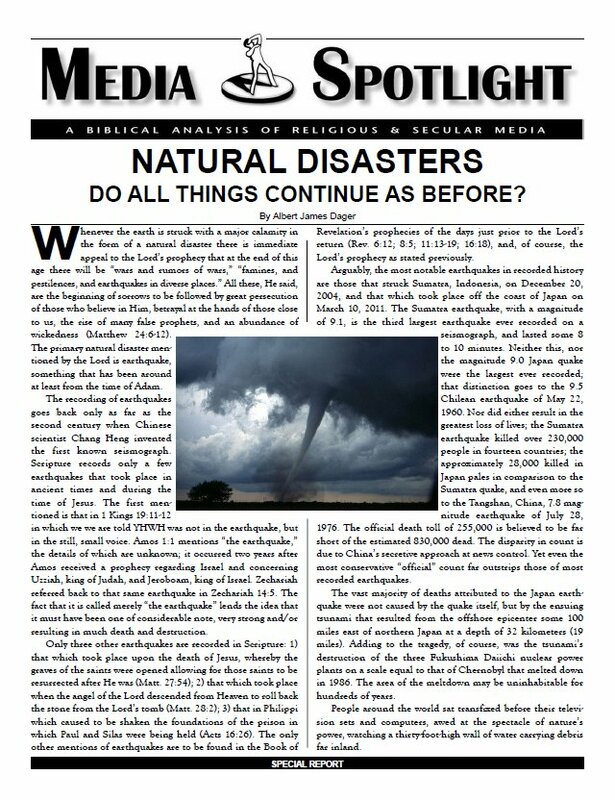 Scientists report a dramatic increase in the number and impact of natural disasters throughout the world of late, and especially in the United States of America. Is this increase attributable to the natural course of nature, or is it possible that spiritual forces are at work? Is Satan more active, or is God the creator of these destructions? There are answers within Scripture that bear consideration. 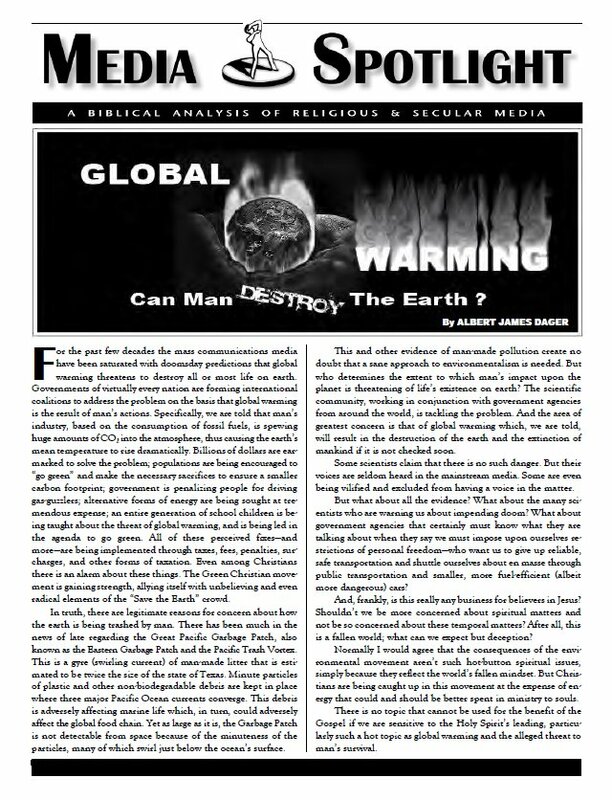 For the past few decades the mass communications media have been saturated with dooms day predictions that global warming threatens to destroy all or most life on earth.